Laos' northernmost province of Phongsali is bordering China (Yunnan) to the north and the west, Vietnam (Dien Bien) to the east and the Laotian province of Oudomxai, a ganglion of the Laotian traffic net in the south. The whole mountainous surroundings (elevations between 450m to 1,800m) are still coined by subtropical forests who are increasingly under threat due to lumber industries for the export to China and expanding slash-and-burn activities of the local population. Heavy air pollution in the months between February until the start of the rainy season is therefore an annually repeating pattern. 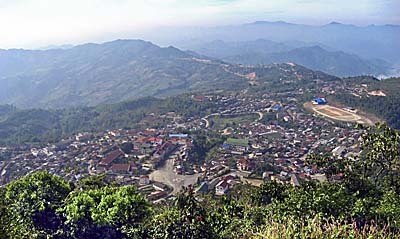 Phongsali town, placed on a high plateau, seen from Phou Fa (Fa Mountain, 1,626m). There is a road upwards to Phou Fa; alternatively, for a walker, the better approach is climbing up the 431 (?) steps to the top of the mountain. Up there one is rewarded by a fabulous view around. There is also a Buddhist sanctuary on the peak. The most important waterway in this remote province is traditionally the Nam Ou (river), who has it's source close to the Chinese border and flows down passing Muang Noi and Nong Khiaw before it's joining the Mekong River a few kilometers north of Luang Prabang. The people of Phongsali are a very heterogeneous collection of dozens of different hill tribes (mountain people) as Tai Lue, Tai Dam, Tai Daeng, Hmong, Khmu, Akha, Phunoi, Hor, Lolo, Sila and many others. Some of these tribes have their subtribes; the Akha alone consist of 18 subgroups. With their extraordinary dark clothes they are one of the most conspicuous tribal people in the wider region. The Hmong People also wear significant, but brighter clothes than the Akha do. According to the large number of tribes living here is a number of different languages spoken. There are, of course, also lowland Laotians represented in Phongsali Province and town. Many of them immigrated in the last decades. Hat Sa, some twenty kilometers from Phongsali town at the riverbanks of Nam Ou. A small village, living from the rivers and forests natural riches. Sand dredging happens with pumps. The sand is probably needed for the ever hungry construction industries. Hat Sa is the start respectively end point for the boat trip to inner Laos. 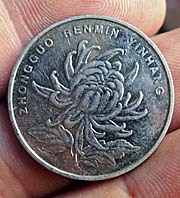 Phongsali's economy is coined by agriculture. Wet and dry rice cultivation, vegetables, livestock and tea make the most of it. The tea plantations in Ban Komaen are a sight itself. The allegedly 400 years old tea trees are up to six meters high and their roots reach deep into the soil. Tea experts claim that they were the oldest tea trees in the world. Pu-Erh-Tea is a tea of top quality. 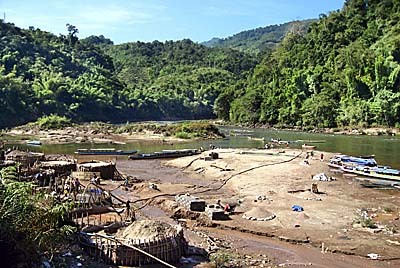 Laos is notorious for the implementation of dams at the many rivers who are mostly tributaries of the great Mekong River. On the upper Nam Ou there is also a dam built. Phongsali is also part of the larger Golden Triangle with it's traditional opium cultivation. The cultural highlights of the region are the mentioned Yunnan-style buildings and some several centuries old Tai Lue temples and sanctuaries. The province capital, the town of Phongsali, is a small place with a small population of not much more than 6,000 inhabitants. 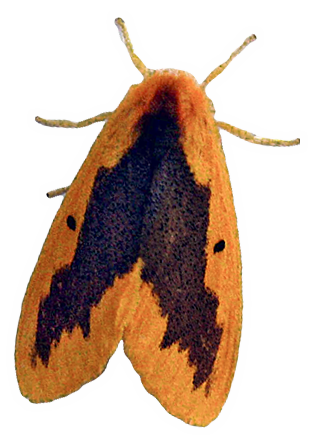 It's connected to Oudomxai by a narrow dirt road (about 230km). The trip from Oudomxai to Phongsali town lasts about ten hours in dry season and is a rough trip usually on a rotten, overcrowded bus who is additionally crammed with peasant goods of all kind - from rice bags to a variety of living or dead animals. In the rainy season the trip migh last much longer and could require an overnight in a village on the way. The road continues behind Phongsali town and leads to the Chinese border. The bus station is three kilometers out of town. There is only one bus daily to and fro Oudomxai, and it starts rather early in the morning. An alternative route would be a boat trip on the Nam Ou. All the way down it lasts three days and means two overnights in villages on the way as in Nong Khiaw. Phongsali town is not situated at the riverbanks of the Nam Ou. The next village at the river is Hat Sa, some 21km away and reachable on another dirt road. Occacionally a bus is going to and fro both places. Hitch-hiking makes sense here. Phongsali is not a major tourist destination. I haven't heared of package tours up to here. Few travellers make the way up into the remote area. There is limited accommodation in Phongsali and a few simple restaurants only. So called 'ecotourism' is promoted, guided tours through the mountainous forests with overnights in a tribal village. Meanwhile there are ATM's and internet in Phongsali, what wasn't the case just a very few years ago. Since the place is situated in an altitude of about 1,430m above sea level, the climate is moderate in summer time and can be quite chilly in winter time. Exceptionally there can be a bit snowfall in cold winter nights. Therefore it's in winter time mostly sunny and dry, while there is much rain in summer time. Luckily, Phongsali exceptionally didn't get bombed by the American air force in the Second Indochina War. 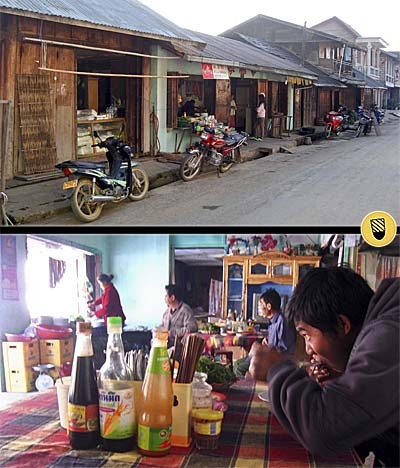 Therefore many buildings here represent a traditional architecture which is very close to that in Yunnan. It's a brick-and-wood building style of the Phu Noi people. The rapid economic development what we see everywhere in Southeast Asia also happens in Phongsali. Directly neighbouring China, Chinese investment is coming in, and with it an extension of the infrastructure and, of course, deforestation, pollution and exploitation of the nature and natural resources.